Now it's easier than ever to access Fire Mountain Gems and Beads from your mobile device. Simply find the QR Code on the back cover of any Fire Mountain Gems catalog, scan the image with your mobile device's lens and the Fire Mountain Gems and Beads website materializes on your screen--no waiting for web browsers or typing on those little keyboards. QR stands for "Quick Response." A QR Code allows the transfer of information from one medium to another--in this case, from our print catalog to our online website via a mobile device. 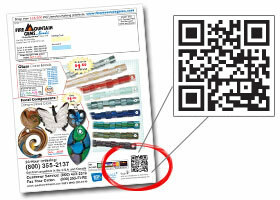 QR codes, similar to bar codes, are basically colored squares, typically black and white, that form unique patterns. These patterns are recognized as data and can be "read." The digital patterns in a QR code typically represent a link to a website. How Do I Scan a Fire Mountain Gems and Beads QR Code? First, you'll need to download a QR Code Reader (or Scanner) mobile app from your mobile device's market or app store--many are free of charge. Search your App store for "QR Code Reader" or "Barcode Scanner"
Select the "Install" button in the upper right corner. Enter your password and click "ok"